Most zoo visitors go to see the animals. U.C. Santa Barbara chemical engineer Michelle O’Malley visits for their poop. That’s because the dung of grazers like sheep, giraffes, and elephants is rich in cellulose-chomping fungi and bacteria. O’Malley’s goal is to steal the microbes’ biodegradation secrets, so that we might be better equipped to turn corn stalks, grass, and other agricultural waste into energy. Michelle O’Malley is an assistant professor of Chemical Engineering at the University of California, Santa Barbara in Santa Barbara, California. IRA FLATOW: This is Science Friday. I’m Ira Flatow. Later in the hour, we’ll check in on the state of firearms research in the US and we’ll look back on NASA’s planet hunting Kepler mission soon coming to an end. But first. Most people visit the zoo to see the animals, right? But my next guest visits for their poop. Now before you get too grossed out, you need to know that, the dung of elephants, and giraffes, and sheep, and other grazers is a veritable treasure trove for microbe hunters, full of hungry bacteria and fungi involved in all sorts of complicated friendships or rivalries. Some are even frenemies. And untangling all that could be key to better biotech, perhaps a way to unlock energy from corn stalks, and grass clippings, and agricultural waste, or develop new drug’s. Chemical engineer and dung detective, Michelle O’Malley, of UC Santa Barbara, presented that work this week at a meeting of the American Chemical Society in New Orleans. She’s here now to explain. Welcome to Science Friday. MICHELLE O’MALLEY: Thanks very much. IRA FLATOW: I just got to ask the question of, what’s so interesting about poop? MICHELLE O’MALLEY: Oh yeah. That’s a question I get a lot. Poop has, for really everything, a mixture of microbes that help wherever the poop came from to degrade food material into products. And by looking at the poop of animals, in this case, we get a clue on how those animals have unlocked the energy contained in fibrous plant biomass, which we typically think of as fiber, that we couldn’t get any nutrition from. So animals can. And that’s why we want to hunt into their poop to find these microbes and their enzymes. IRA FLATOW: Give me an idea of how you actually hunt around? Do you follow the animals, or what’s the process like? MICHELLE O’MALLEY: So, in fact, it is better to have fresh samples. 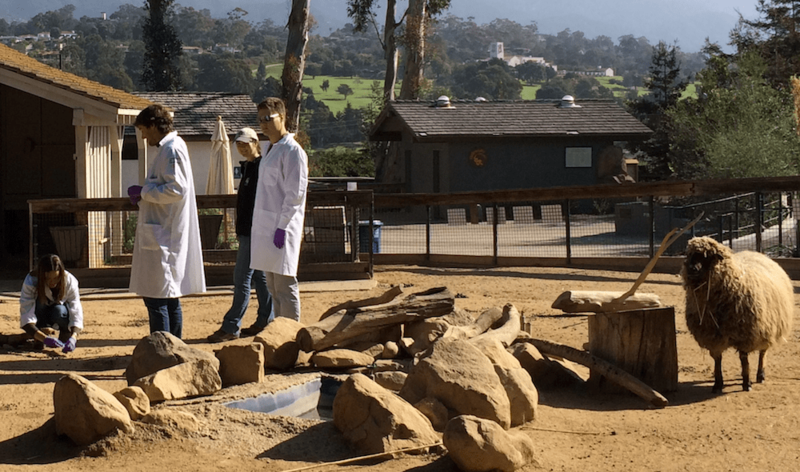 So when my research group goes to the local Santa Barbara Zoo to do this, we wait for the animals to donate, so to speak, to our cause. IRA FLATOW: Love it, love it. MICHELLE O’MALLEY: And then, we scoop up just a tiny bit, take it back to the lab, and then, where we coax out the microbes that are doing the degrading. IRA FLATOW: And your lab must be a smelly place, I would imagine. MICHELLE O’MALLEY: Fortunately, these are anaerobes, meaning that these microbes that we isolate don’t want oxygen around. That means that we can lock them up in an oxygen tight container, or oxygen-free container, so we don’t have to smell them, which is good. IRA FLATOW: What are you actually looking for, or what would be the great find in the poop that you right home about? MICHELLE O’MALLEY: The principal thing we’re after are enzymes, which are proteins that do the action of taking plant matter and turning that into sugars that the animal derives nutrition from. So initially, we were looking for enzymes in these unusual organisms that nobody has really looked at before. IRA FLATOW: And what do they tell you? And what do the enzymes do for you? MICHELLE O’MALLEY: So the enzymes work together to perform the complex chemistry of breaking down a polymer called, cellulose, that is really just a network of sugars and our bodies can’t process cellulose because we don’t have any of the enzymes to break it down into bite-sized pieces of sugar. IRA FLATOW: And you said microbes can be frenemies, friends and enemies at the same time. How does that work? MICHELLE O’MALLEY: Right so it turns out that the microbes that produce these enzymes, there’s many different types of microbes, fungi, bacteria, and there’s archaea in there, there’s viruses, there’s lots of things going on. And so, it turns out that these microbes produce different flavors of enzymes and they will change what they do depending on who they see. So take for example, anaerobic fungi are really good at making the enzymes that enable access to other microbes. And bacteria will come in and sweep up those byproducts and then, use another class of enzymes to turn that into something else. And that means that there has to be a balance of the microbes in the microbiome or else, one will take over. And so, they have a way of talking to each other, benefiting from each other, but also keeping each other in check. 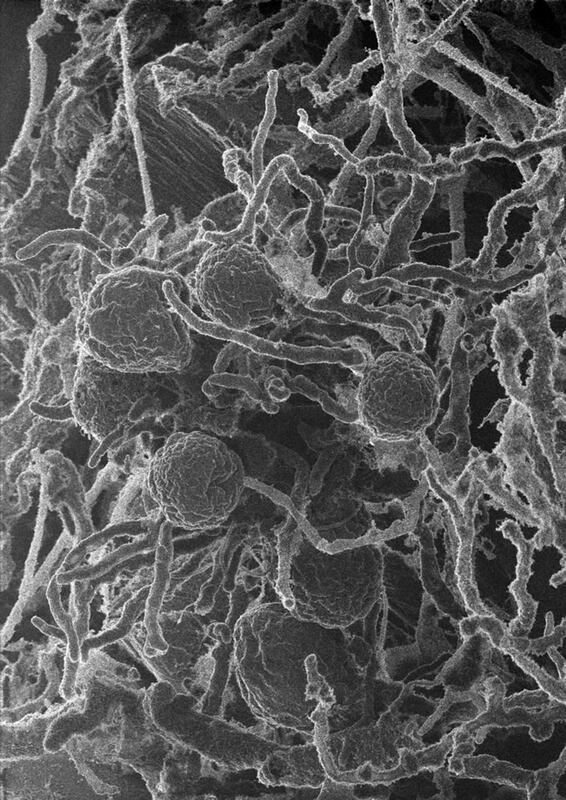 IRA FLATOW: So tell me the kinds of secrets that you can steal from these microbes as relates to biofuels, or drugs, or whatever you could learn from them? MICHELLE O’MALLEY: Right. So I’m a chemical engineer and that means that I want to harness the power of nature for producing useful products for humanity. And one way that we can do that is by, of course, learning from their enzymes and trying to produce those enzymes at scale, but another way that we can do that is by actually manufacturing with the microbes themselves. So trying to have bacteria and fungi working together in bioreactors to produce complex chemicals that not one of them could produce on their own. And those could be fuels or actually, if you can believe it, even antibiotics. IRA FLATOW: Yeah, well, we know that there are a lot of bacteria in the soil that produce antibiotics. The problem is, growing them in the laboratory because they don’t like to come in from the cold. MICHELLE O’MALLEY: Right. That’s exactly right. Something like 99% of microbes on Earth have not been cultured and cannot be cultured. Part of that is because they need to have their microbial community and their neighbors around in order to get all of the nutrients that they need to survive and to actually grow in the lab. And that’s part of what we’re working on as well. IRA FLATOW: Now, I know you’ve worked with some more exotic animals like giraffes to more exotic animals. You know where I’m going with this. Have more exotic gut microbes? MICHELLE O’MALLEY: Yeah. So it turns out that that is in fact true. We and others have studied wild herbivores, so to speak, that are out and really have to have scrappy microbiomes in order to live, and the more extreme the location that you find the animal generally, the more diverse you find the microbial community that helps it to get energy. And so that is very much true. MICHELLE O’MALLEY: We haven’t done that yet. That would be a really interesting thing to try in the lab for sure. IRA FLATOW: Might the human gut have any microbes useful to biofuel production, drug development, something along those? Lines. Why limit it to animals? MICHELLE O’MALLEY: Right. We work on animals as a starting point, but it’s very true that the human gut microbiome, we’re learning more and more about it, and there might also be similar types of chemicals that are made by microbes to keep each other in check that could be harnessed as new drugs and antibiotics. So it’s very much a potential. IRA FLATOW: If you and your colleagues hang out so many times at the zoo, around these animals, does your microbiome pick up their microbiome? MICHELLE O’MALLEY: It’s an interesting thing to consider. I think that we always become a reflection of our environment, no matter where we go. Our microbiome is no different. Many of the microbes that we study from animals, chiefly anaerobic fungi, however, will not live in our digestive tract because it’s simply too short for them so they can’t hang on during the ride. The animal’s digestive tract, in particular, ruminant animals, have many compartments. And so, they are able to harbor diverse type of microbiome that we just can’t help to survive. IRA FLATOW: Tell me your dream, an animal poop that you’d love to get under your microscope that you haven’t had a chance yet to sample. MICHELLE O’MALLEY: Actually, the musk oxen that live in the extreme arctic thrive on really scarce plant material called, lignocellulose, that– well actually, it’s widely abundant but they don’t see it a lot. And so they must have a really good microbiome. So when they happen upon that lignocellulose, they get as much energy as they can from it. We would love to travel there and get some of those samples. IRA FLATOW: The musk oxen? So you haven’t gotten them yet. Can somebody send you something? If we put a shout-out here? Somebody send you– have to be fresh poop that you’re looking for that. MICHELLE O’MALLEY: Right. I would stop short of requesting that people send me poop to the lab. But, certainly, if someone wants to fund us to send us there well, that would be great. IRA FLATOW: Is there any– I’m going to give you my blank check question. I do not have one with me, but just, if I did, and you could curry and take it to create equipment, or go someplace, what would you do with it if you had unlimited sources of money? What do you need to spend it on? MICHELLE O’MALLEY: Right. So we actually need to discover the little chemical linkages between all of the microbes. And those are things called metabolites. So this is what cells are making, and there’s thousands, tens of thousands, of tiny little chemicals that the cells make, and each one of them, even if they’re there in low abundance, connect the microbial community. So we would love to measure all of those connection points in great detail in order to truly understand how microbes communicate in the gut microbiome. MICHELLE O’MALLEY: Of course. Microbes are, in many ways, like us. They have their friends. They have their enemies. They have their frenemies, as we started out saying. Microbes become specialized and you can’t teach any one microbe to do everything that you’d like it to do in biotech, but by dividing and conquering, just like people do, it’s a new route to making things that we can’t make right now in terms of biofuels, bioproducts, and drugs. IRA FLATOW: Do you think that now that you– because you go to the zoo for the sampling and they’re a captive audience, so to speak, would the animals in the zoos have a different microbiome than the ones that might be in the wild, the same animals? MICHELLE O’MALLEY: Right. So we’ve noticed that that is, in fact, the case because the zoo animals don’t have the same stressors, they have a pretty regular diet, and some of them are actually constantly fed low levels of antibiotics just to keep them from infection. And so the microbiome that you see in zoo animals is often very different then what you see from wild animals. IRA FLATOW: Does that hinder your work, saying, I’d rather have something out in the wild, instead of in the zoo? MICHELLE O’MALLEY: So our goal, as an engineering team, is really to try and develop the most hardy biotechnology. So that means that the cells that survive under the widest collection of conditions, are the ones that we want. And so, in that way, getting samples from the zoo animals helps us because we know that they are pretty hardy microbes and they’ll grow under many different conditions. And so in our work, it actually helps us. IRA FLATOW: All right. Fascinating work. Do you visit other zoos besides Santa Barbara? MICHELLE O’MALLEY: We would like to. We have some calls out to other zoos in other states that have different animals, for example. We haven’t quite gotten there yet, but it would be great to do so. IRA FLATOW: OK. Well maybe you’ll get a few calls after both people who listen to this give you a call. IRA FLATOW: Michelle O’Malley, Assistant Professor of Chemical Engineering at the University of California, Santa Barbara, UC Santa Barbara. Thank you for joining us. IRA FLATOW: Have a good weekend. This elusive praying mantis lures insect prey by exploiting flower-like attributes.